Coblentz is a USDA-ARS research scientist with the USDA Dairy Forage Research Center in Marshfield, Wis. Akins is an extension dairy scientist with the University of Wisconsin-Madison. The use of baled silage techniques for forage preservation has expanded significantly during the last decade and is especially popular with small or mid-sized dairy and beef producers. Many of these producers are familiar with good silage management techniques through previous experiences with precision-chopped silages. Baled silages are often produced in long-stem form, which may restrict the access of fermentable sugars located inside the plant to lactic-acid-producing bacteria adhered to the plant surface. Cutting systems within many balers are used primarily to facilitate blending of diets within TMR (total mixed ration) mixers, or to ease removal of baled silages from ring-type feeders by livestock. 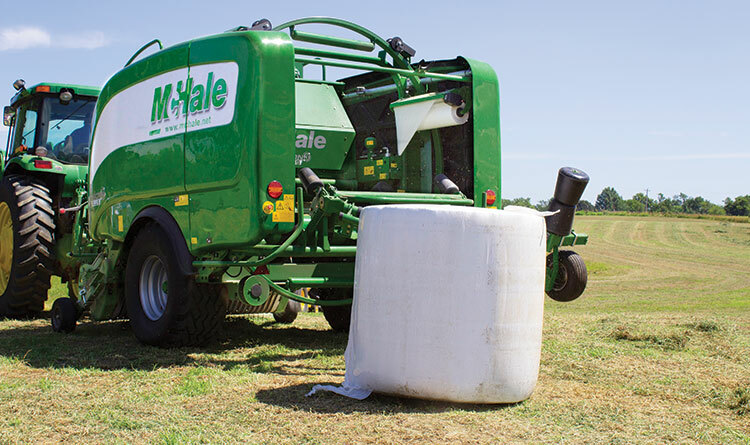 However, they also offer the theoretical potential to improve silage fermentation by increasing bale density and by facilitating the release of sugars through the cutting action within the baler. A few previous studies have evaluated these concepts, but the demonstration of clear, consistent effects on baled silage fermentation have been elusive. Recently, we decided to further investigate the potential for improved fermentation in baled silages by engagement of cutting mechanisms within the baler. Two studies were conducted at the University of Wisconsin Marshfield Agricultural Research Station. The first study (Experiment 1) included 31 round bales (4 by 4-foot) comprised of an alfalfa-orchardgrass mixture (57 percent alfalfa). Bales were made between approximately 40 and 70 percent moisture, which exceeds the normally recommended range for round-bale silages (45 to 55 percent moisture). Experiment 2 included 47 bales of the same size made from meadow fescue, tall fescue, or orchardgrass. All bales were made with a New Holland Roll-Belt 450 round baler equipped with 15 cutting knives spaced about 3.2 inches apart; the cutting system could be engaged or disengaged remotely from the cab of the tractor. During both studies, the baler operator maintained a 5.5-miles per hour ground speed while baling. Generally, previous studies have reported a somewhat consistent and positive relationship between particle-length reduction and bale density. However, this effect has usually been relatively modest in scope. 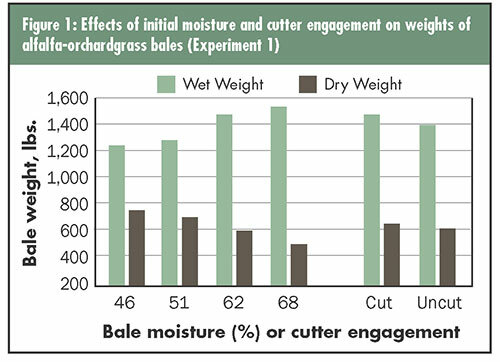 In Experiment 1, wet bale weights were increased by 4.3 percent (60 pounds per bale) by engaging the cutting mechanism, which was statistically significant (see Figure 1). After correcting for moisture, dry bale weights improved by 3.2 percent (20 pounds of dry matter [DM] per bale), and DM density by only 2.1 percent (0.3 pounds DM per cubic foot) (see Figure 2). Cutting effects on dry bale weights and DM density were not statistically significant. Figures 1 and 2 illustrate some of the complexity in isolating the specific effects of cutting on bale density and subsequently on silage fermentation. 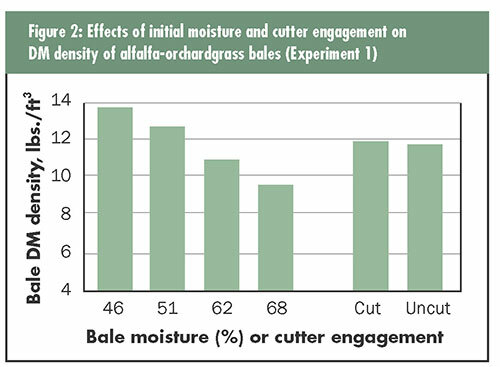 In this experiment, initial bale moisture had a far greater effect on bale density than cutting. In contrast to the rather meager density gains associated with cutting, DM density went up 45.4 percent by reducing initial bale moisture from 68 to 46 percent (9.4 compared to 13.6 pounds DM per cubic foot). Although wetter bales were heavier because of the additional water, they also contained less actual forage DM. Generally, DM density is increased with more revolutions of the bale within the bale chamber prior to tying and ejection. For Experiment 1, bales produced within initial moisture groupings of 46, 51, and 62 percent achieved DM densities of 13.6, 12.8, and 11.1 pounds of DM per cubic foot, all of which exceeded the often-recommended target density of 10 pounds of DM per cubic foot for good baled silage. Only very wet (68 percent moisture) bales exhibited DM densities (9.4 pounds of DM per cubic foot) less than the recommended target threshold under the conditions described for this experiment. Figure 3 illustrates the effects of initial bale moisture and particle-length reduction on the final silage pH for bales produced in Experiment 1. It was obvious that silage fermentation is primarily driven by initial bale moisture, as shown by an increasingly lower (more acidic) final pH as bales became wetter, regardless of cutter engagement. For Experiment 1 (Figure 3), this was further documented by greater production of lactic and total fermentation acids, as well as lower concentrations of residual sugars, all of which indicate a more aggressive fermentation in wetter bales. Generally, these relationships are quite strong, but they also can be confounded at very low initial bale moistures, when little production of any fermentation acid occurs. In addition, the relationship between final silage pH and initial bale moisture potentially can be confounded for very wet bales, in which undesirable fermentation products, such as butyric acid, may accumulate. 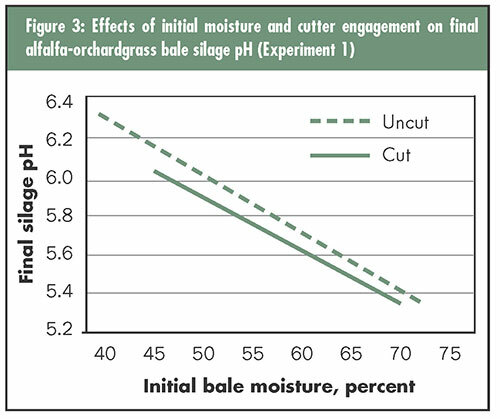 For both experiments, the relationships between final pH and bale moisture were statistically distinct for cut and uncut bales. Unfortunately, the advantages of cutter engagement were very modest, generally ranging from 0 to 0.16 pH units across the two experiments. While this response indicates an improved fermentation in response to cutter engagement, it is questionable whether the moderate nature of this response justifies particle-length reduction solely on the basis of fermentation improvement. The inherently restricted nature of fermentation within baled silages requires additional emphasis be placed on exclusion of air for preservation of this unique silage type. Excellent preservation of forages can be achieved, even with dry silages (less than 40 percent moisture) producing minimal fermentation acids, by promptly applying adequate plastic (at least six layers), and inspecting and maintaining the ensiled product until feeding. While there may be a number of practical or logistical reasons for particle-length reduction, these results do not suggest that cutter engagement can be justified solely on the basis of improved fermentation. This article appeared in the January 2019 issue of Grower on pages 18 and 19.